If you have ever asked yourself these questions, then the “Jumpstart Your Freelance Writing Career” workshop is a must for you to attend. “Jumpstart Your Freelance Writing Career” is a two-day workshop that offers practical tips on how to get published, crafting stories, and writing them. It also aims to dispel the myths that surround freelance writing and help the participant start out with the proper mind frame needed to start a career as a writer. The workshop is organized by Writer’s Block Philippines, a freelance writing trio who collectively has over 20 years of experience in freelance writing covering a wide spectrum of journalism and creative writing that ranges from lifestyle, news, and arts and culture. “At one point, we also asked ourselves those very questions and came across their answers largely through trial and error. That’s why started “Jumpstart”; it was time to come out with something that would help make the process a bit faster for aspiring writers,” says Ana Santos, who left her senior management post in an major financial institution to pursue a career as an advocacy journalist. Her writings on sexual health rights and women in armed conflict have been published in both the local and international press. “We all graduated with a Communications degree, but discovered that while school can teach you how to be a good writer, how to make money from writing is another story,” says Nikka Sarthou whose by-line can be seen in major lifestyle publications. Sarthou is also the only one among the trio who has been a full-time freelance writer for five years, proving that writing can indeed be both a viable source of income and a career. “Jumpstart Your Freelance Writing Career“ was launched last year and was warmly received by the writing community, prompting Writer’s Block Philippines to do another run. This time, the event will be held in partnership with Enderun Extension, which is Enderun Colleges’ resource for continuing education. “A writing workshop conducted by Writer’s Block Philippines will provide the perfect complement to our line-up of courses that cover sales and marketing and business management. Writing is an essential skill whatever your business and is perfectly in line with our objective of providing world-class culinary education that is holistic in its scope and world-class in standard,” says Daniel Perez, director of Enderun Extension. 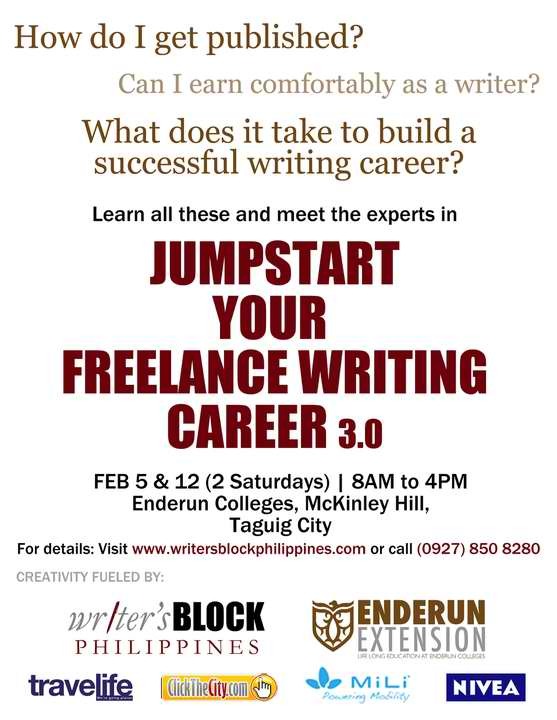 “How to Jumpstart Your Freelance Writing Career 3.0” will be held on February 5 and 12 at the Enderun Extension College at 110 Campus Avenue McKinley Hill, Bonifacio Global City, Taguig City. Participation fee of Php 4,500 covers two-day course fee, CD hand-outs, workshop kit/goodie bag, and lunch with light snacks courtesy of Enderun.